We are due to start work on drainage improvements on the A4175 Cherry Garden Road and A431 Bath Road in Bitton on Monday 2 July 2018. This work will take a minimum of two months but could take up to three months to complete. For the first month, we will operate under temporary traffic signal control. However, for the second month, we will need to close different sections of these roads in order to carry out the works safely. See the download section on the right for diversion maps. While road closures are in place, diversion routes will be signed. Access for residents and businesses in Cherry Garden Road and Bath Road will be maintained but there will be no through access. 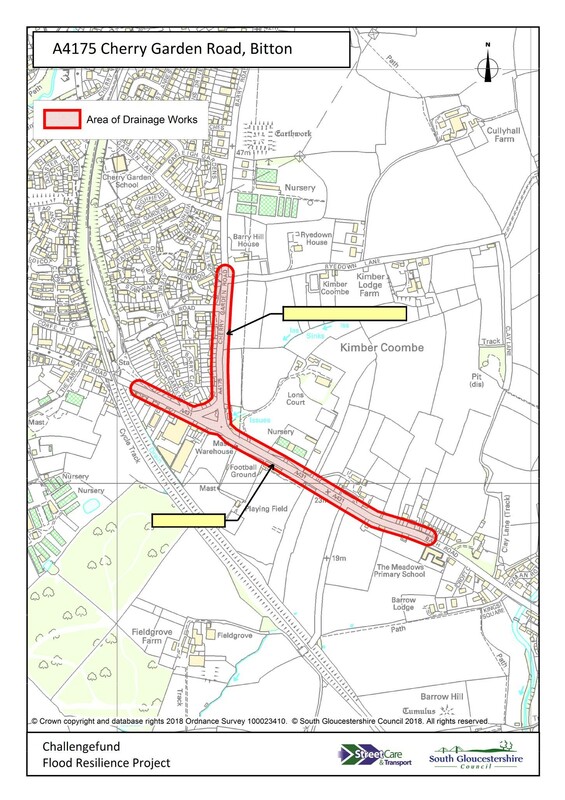 Cherry Garden Road and Bath Road were selected as one of nine sites across South Gloucestershire as part of a wider £3.35million Government funded scheme to improve drainage and flood protection systems. The road floods on a regular basis causing traffic disruption, damage to properties and to the highway. We have carried out comprehensive survey work which shows there are numerous defects with the existing drainage system. Whilst our CCTV surveys revealed significant damage, we may find further defects as we begin work on site. It is therefore difficult to provide an accurate timescale of the works but we anticipate it will take a minimum of two months. We will provide updates for residents as we begin work on site. Bus services will be affected by these roadworks and more information will be made available shortly. We will do everything we can to minimise the impact on bus passengers and apologise for the inconvenience caused.